Ships in 2 Weeks. Please email for current wait. 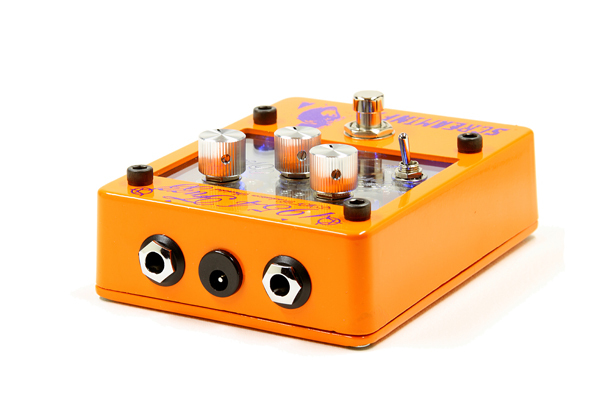 If you want a big sounding fuzz that is articulate, this is for you. Patent pending! 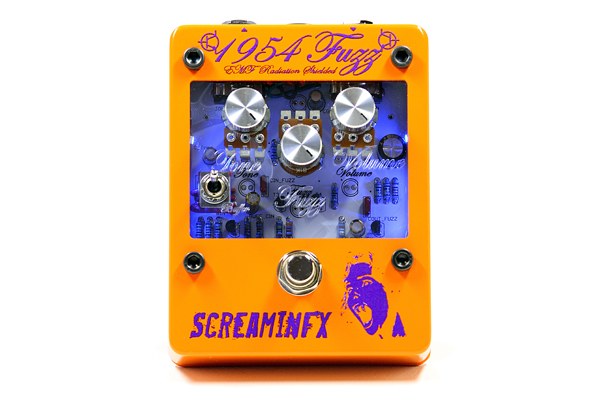 For pro musicians that want an articulate fuzz that works with other pedals and doesn’t wash out the sound of your guitar, the 1954 transparent fuzz was custom designed so that your sound is fuzzed, not killed. It is both Electric and Bass guitar friendly. Yes, we love Hendrix and you vintage off with the 1954, especially with its wah friendly front end, but there are a huge amount of other sounds this pedal dominates from Alternative / Indie to Stoner Metal. It features an original fuzz circuit based off of sounds from 1966 but is not a direct copy of the same old fuzz pedals we’ve all heard before. No one else makes anything like it! It has an engineered silicon transistor core that sounds a lot like hand matched germanium. The 1954 transparent fuzz pedal is a tight, well rounded fuzz that can be used as a base tone for your rig on many songs, not a one off wacky fuzz. It was thought up after Dr. Wilk realized problems from an RF wireless amplifier he was building would actually fuzz a lot like vintage transistors without any of the problems. Wah wah pedal friendly fuzz. An optional buffer stage at the input can be switched on so that it works well with a wah or other pedals in front. This means it also works well with active pickups too. With a wah, you can get those huge Hendrix sweeps. The buffer matches your guitar better and you’ll hear some of the treble you often lose with fuzz pedals. Maintain Stage Volume or Boost / Overdrive your Guitar. The output is actually a booster stage which will make sure that when you turn it on, it is never quieter than you clean sound. You can dial the fuzz back, turn the boost up and end up with some really nice overdriven sounds. The tone control keeps it warm. To keep that vintage warm tone, you can roll the tone control back and cut out some of the higher end treble. This works great to keep it warm when you have the buffer on. Bass friendly with big low end. I like to palm mute and still feel the room shake which means this was designed with a big low end. Ends up being perfect for bass guitar. Proper EMF Grounding helps reduce noise. Sure, fuzz pedals all have a ton of gain to get them to fuzz, which means they will pick up radio stations if you angle them right. But many of them don’t have correct grounding of the case which helps reduce these problems. A lot of this stems from germanium transistors, which need opposite polarity and makes it harder to ground. The 1954 transparent fuzz pedal case is completely RF grounded which helps reduce noise from the outside. Even the clear lid, it’s all RF grounded and patent pending. Switchable buffer makes it wah wah friendly and works great with other pedals or active pickups in front. Not many fuzz pedals do this. What is the story behind the 1954 Transparent Fuzz? This pedal is a marriage of many years’ experience design fuzz pedals with the desire to build a new looking guitar pedal to really show off and pop on your pedal board. It all started with the design of the 1954 fuzz, this pedal has the exact same circuit insides. I wanted an articulate fuzz so I made up a circuit that keeps fuzz but cleans it up. I wanted it to work with a wah to get Hendrix style sweeps without the oscillation, so I added a buffer that can be turned off if you want the old school input impedance. All this was put together with a look that shows off the internal circuits for a complete package. Finally a MUSICAL fuzz that can still get the big fat fuzz sound, but you can slim it down too. Very versatile, works great before or after my overdrives (EHX glove and Banshee Boost). The buffer switch is great so I can run my Vox wah before the fuzz. Lots of options to tweak your sound too. This is my favorite fuzz pedal of the year! Where do I vote? I have a few fuzz's I will now be selling as I can get every sound I want out of this guy. I received the pedal yesterday...and I love it!! It's exactly what I was hoping it would be. Thanks for providing info/tips. I have to say I really appreciate having the buffer switch on/off option. Makes a huge difference with a wah pedal having the buffer but also wonderful to be able to get the unbuffered sound. Awesome. I received my pedal in the mail, yesterday. You are a master of your craft, sir. This pedal is amazing. It's hard to describe it, though. I've really never heard a fuzz pedal with this particular sound. It has all the wonderful characteristics of fuzz that everyone loves and none of the side effects that everyone hates. I guess a controlled fuzz would work to describe it. What I found most impressive was the clarity in chords. The chord structures really sing and don't sound mushy or chaotic. The only downside I have found with this pedal is that it's built so good that I hate to put my foot on it! I will definitely be checking out your other pedals in the future. In case your interested, I was playing a 2015 Epi Les Paul traditional pro through a Fender 65 TRRI. 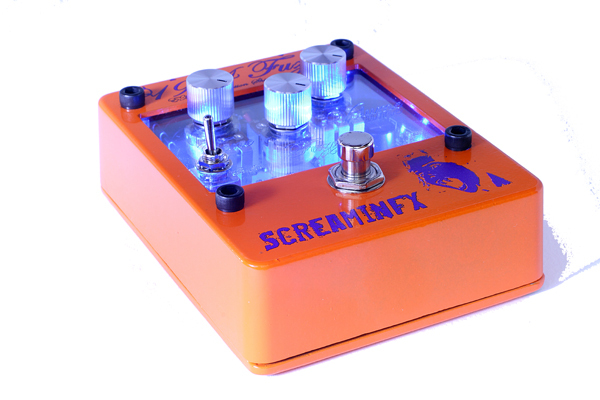 The ScreaminFX 1954 Fuzz delivered just as advertised, offering fat, warm germanium sounding fuzz with none of the instability attendant with germanium transistors. It also offered the kind of increased dynamic response to fingerpicking, pick attack, and guitar volume adjustments normally associated with germanium but usually absent or diminished in a silicon fuzz. Very articulate, it allowed the different pickup settings to come through clearly. Read the rest here. The 1954 fuzz is amazing. Thanks for creating this masterpiece. Loving it! so - got it. been messin' with it for a while now. LOVE IT. a great effect pedal. it has got significant CHARACTER rather than just a slog full of un-tameable noise. i have a bunch of different guitars - all with different types of pickups obviously, some active, some passive - and they ALL grab this fuzz circuit differently and not ONE of them is unusable. they all take to the tuning and tone of this circuit in a VERY harmonically pleasing way. It is DOESN'T have to be loud. oddly enough - I think i like the way the passive PU's work with this thing best... Looks like I may have to get the germanium one too.... :-P Kudos to your electronic prowess. I'm a fan. 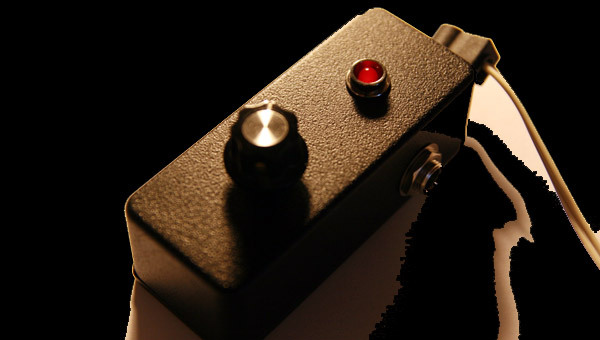 Guitar Buffer Pedal that is tuneable which helps it fix fuzz problems. It will also drive long cables and do all the things a good buffer should. Solid metal version of the tuned silicon fuzz I designed starting with a basic Fuzz Face and de-tuned to be more useable. Classic sounding fuzz with built in on/off buffer that makes it work well with other pedals such as a wah-wah before the fuzz.